And I went to the police to get the information about the man who hit my car, so my insurance agent can track him down, so we can get his insurance information. Important tip: if you're in an accident, get his/her: name, car number, license number, and insurance policy number. I forgot the latter, which is what's causing me a headache. I got his cellphone number, but it doesn't seem to work; next time, call it before leaving the scene to see that is works. Note down the time and place of the accident, of course. I should probably add: yes, take the time to ask for the phone numbers of some of the people nearby who could be witnesses. It hasn't come to that yet, and I hope it won't so that I won't regret not having done so. P.S. I'm leaving on Wed. I will be blogging my trip, with pictures. It's a good month to advertise on this blog (traffic should be up for a while), nudge nudge. How Come You Were Just Sitting There? My car got rammed while I was stuck in traffic on the way home from work on Thursday. I didn't even stop short; several cars in front of me were negotiating a merge. After several seconds of waiting, I was suddenly rammed in the back by someone who obviously wasn't paying attention. Neither of us were hurt. My damage didn't look so bad at the scene - it looked like a crushed bumper - but was revealed to be more extensive when I got home. The trunk won't open and the trunk lid is askew. It will take quite some money to fix. Unfortunately, my car is pretty old and I only have 3rd party insurance. If I'm lucky, the guy will admit to being at fault, and his insurance will cover it. I don't know that he will admit to being at fault, however. At the scene, between an apparent sense of confusion, he asked me why I was just sitting in the middle of the road not moving, as if that somehow made it my fault. His damage was more extensive (being in the engine area). And he was young. As I was going to get my car looked at the next morning, I began to feel faint: seriously, severely, faint. Cold sweat, drained face, nodding head, everything. I couldn't pull over. Somehow I managed to drive to the car garage and then lie down on the back seat for twenty minutes. After that I could get up. Every five to ten minutes I had to lie down again (which I did, several times, in the garage waiting room). The garage guy had an assessor on staff who worked for/with my insurance company, so that was taken care of. The rest will have to wait until my agent can contact the other guy's insurance. Sometime during my near catatonia at the garage, I got a call from my tenants who said that a tris (a thick Israeli window blind) was broken and the guy they had over said a) it had to be replaced, and b) he could replace it for 500 NIS or 600 NIS. Every handyman in Israel gives two prices; the cheaper way is always "ok, but not as good as" the more expensive way (the guarantee for the more expensive way isn't longer, by the way). I don't know the science behind this. Maybe I'm supposed to feel that I'm getting a discount by choosing the cheaper way. Or maybe I'm supposed to be responsible and choose the more expensive way. Either way, I'm pretty sure I'm being robbed. In my confused state, I mumbled that she should choose the quick way; then I hung up and fell into another ten minute stupor. Only hours later did it occur to me that fixing a tris is not an urgent matter, and I should really have gotten someone else to look at the job and maybe offer a price for fixing the tris, rather than replacing it. I was dog sick from Friday morning until Sat morning. By Sat evening I was pretty much fine. I've had 24 hour things before, but never like that. The good news is that I got sick here, and not in Ireland. The other good news is that I'm better. The other good news is that the embassy called and my passport is waiting for me to pick up. Two JSGC session reports are up. Oct 18: Games Day. Games played: Carson City, GoSu, Taj Mahal, R-Eco, El Grande, Lo Ra, Tangrams. Oct 26, in which they decide that they like Nile. Games played: Nile, Amun-Re. The overwhelming majority of the games listed here are meant for newer players, non gamers or the like. I don't list the complicated, heavier games for gamers only. I'm starting with this unusual choice for a board game list, because the iPad (and other tablets) is actually a perfect platform for playing thousands of face to face games for two to four players. Because you don't need to buy the physical components, you can stack all your games in a teeny space, the games (if not the tablet) cost very little, and you don't have to cut down old trees to make them or use fossil fuels to ship them. Tablets have their own environmental impact in their making, so that's a tradeoff; but if you're getting one anyway, most of the games on this list are available electronically. The same way that Dominion (later on this list) took the gaming world by storm a few years ago, this game took the gaming world by storm this year (and, like Dominion it uses another auxiliary mechanic from Magic: The Gathering tournaments). This is a game of drafting cards. You get a hand of cards; pick one and pass the rest. Everyone reveals the card they picked and puts it into their tableaux. Repeat. Done. Score points based on the combinations of cards you have at the end of all the passing. The graphics are fantastic, the theme not so visible. It's easy to learn, with depth enough to spare. Apples to Apples is a party game that is simple to set up, learn, and play. There is no writing involved, and no board. And unlike many party games, reading all the cards doesn't ruin the game. Each player has a hand of red apples (nouns) with which they have to match the green apple (adjective) flipped up. Each player has a chance to judge the best match. The cards you have in your hand never exactly match what gets flipped up; you have to do your best! Risk is a long game of laying low, with player elimination and just too much in the luck department; this game is the perfect evolution to, and replacement for, Risk. Unfortunately, it's out of print, so it's a bit hard to find, and pricey when you find it. The rules are easy, the components are beautiful, and it's a lot of fun. Carcassonne is a fairly new game that is a bit more complex than some of the other games here, but the beautiful pieces and the fun game play are worth the time to learn. Pick a piece from the pile, rotate and place it so that it fits on the board (like dominoes), and then optionally place one of your pieces on that tile. There are several ways to score, some of which occur during the game and some of which only at the end of the game. There are dozens of versions to the game, and some of the versions have several expansions. The one that I linked to is called "Hunters and Gatherers" and is a good standalone game to start with. Checkers is a classic, and rightfully so. The rules are very simple, although there are regional variations. Although the game often hinges on who makes the first major mistake, it is worthwhile learning the tricks and the care necessary to play well. With two experienced players, there is a lot of depth to explore. It's cheap, and grandpa will play with you. Connect Four is a classic two-player strategy game, where the object is to get four in a row before your opponent does. Easy to set up, easy to learn, hard to master. Dominion won nearly every major game award last year. It's a game based around deck building: as you play, you acquire cards which get shuffled into your deck. You need victory points to score, but too many early victory points will clog up your deck, making it harder to acquire more points. A brilliant adaptation of a mechanic, it plays quickly and every game plays differently. The game now has several expansions, all of which are good. The link I provided is to a nice inexpensive board; you should really play with a much nicer board. Hive is another new game with simple rules and cute buggies. Each round, you either add a piece to the table so that it is connected to the other pieces, or you move a piece. When you move a piece, you can't break up the hive while doing so. The winner is the one who surrounds his or her opponent's queen bee. Each player has eleven pieces, with five different bugs and abilities. Its simple rules and nice pieces make this a game that generally gets several plays in one sitting. Ingenious (sometimes called "Connections" or "Mensa") is another new and neat abstract game, where you score points by placing domino like pieces to create lines of colors. Your final score is whatever color you have the least of. It's another pretty game with simple rules and a lot of replay. A little plug for my own game. This is a simple set-collection auction game with a Frankenstein theme. It fits in well with the other games on the list: easy to learn, quick to play, lots of replayability. Of course, I may be biased, since I designed it. This game was published by Reiver Games. There are several games of speed reaction / pattern recognition on the market; I chose this one because of the components. Players flip cards in turn and grab for the totem in the middle as soon as two matching cards are revealed. Don't play with friends who have sharp nails or finger jewelery. After a decade and a half, Magic is still The Bomb when it comes to collectible card games, although Yu-Gi-Oh sells more cards. These are not easy games to learn, but quick start guides can get you off the ground fairly quickly, and then you have months and years of challenging game play ahead of you. Go is my favorite two-player game; this is my favorite multi-player game. I hadn't included it in previous years because I thought it might be too complex for the beginning player, but I think I've been underestimating people. I've seen new players pick it up and love it. It's not easy to learn, but it's not that hard, either; it's just hard to master. A brilliant, brilliant game engine. This is another short and sweet card game, with simple clever mechanics that leads to enjoyable but no stress game play. Easy to learn and easy to play. A game of rummy, but a good one. And also playable with the grand-folks. This is the perfect game for beginning adult gamers that I use to hook new players into my game group. Many of my fellow bloggers think that this, rather than Settler of Catan, is The Game. I disagree, but who am I to argue? New players will probably find this a great intro game, with lots of choices and great game play. There are several editions of the game. Wits and Wagers does this in the form of a poker game setting, while Balderdash requires you to make up funny possible answers. Both have won awards and acclaim as a generation better than you-know-which famous trivia game. Winner of dozens of recent awards, Zooloretto is a cute game for kids and decent game for adults. Simply take the animals as they are revealed from the deck and try to fit them into your zoo without overcrowding. I've been single - or effectively single - before. But I've never had so much to do every day. Each day I have a list of ten or more things that must get done, and I'm the only one around to do it. I thought things would calm down after the summer or moving, changing jobs, etc. It must get easier with time. RIght now I feel I have to be on, all the time, full time. I also thought I would be able to live within my means, finally, but I'm still spending over a thousand NIS a month more than I'm making, and that's not sustainable. There must be a way. I could save the money I'm going to be spending on (already booked but not paid for) lodging and travel in Ireland. Luckily, the trip budget was allocated from separate funds (blog income) a long time ago; I already bought the non-refundable plane tickets. Otherwise, I might just have cancelled the whole damn trip. Cell phone: Orange's offer to provide me cell-phone usage in Ireland was a joke. Instead I am renting an entire cell phone from D.systems Ltd for a few NIS a day, and $0.59 calls out and free calls in. It's too expensive to use in the US, but in the US I will always be with my friends Bill and Shirley who have cell phones with great service plans, so I won't need one. Passport: I discovered a week ago Sunday that my US passport had expired in May. Ouch. A week ago Monday I dutifully called the embassy at 10:00 am (when they are open for receiving phone calls) and they said to come in without an appointment the next day. When I asked, they said that I could also come in today, if I got there before 11:00 am. Electricity: I think I have a GB adapter somewhere. Have to go find it. Money: I need to get some Euros for public transport and serendipitous spending. I have enough dollars to survive until Kansas City, and when I'm there I can use a US check to get out some money from my US bank account. Activities (Ireland): Dublin, craft stores, or hiking every day, pubs and music every night. Shabbat hospitality courtesy of the Dublin synagogue and/or chabad. I hope to get a game in on one Thursday evening in Dublin. Activities (US): I will be in Kansas City from Sunday evening until Tuesday early morning. Turns out that EVERYTHING worth doing is closed on Sunday and Monday in Kansas City. So not much planned. After that, it's pretty much BGG.con all the way. I am/was worried that Halloween would give me one less day of cushioning. Turns out that Halloween is not actually a US federal holiday. Who knew? Then again, why would it be? It's Alive! 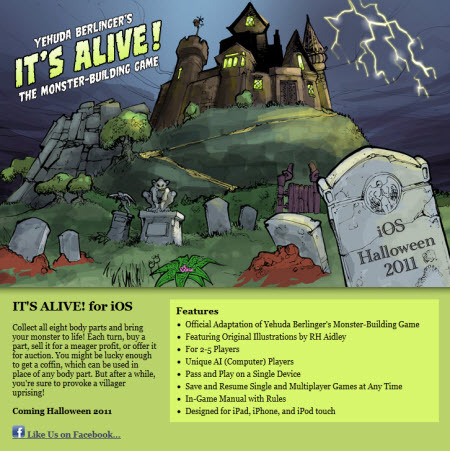 is coming to iOS (in time for Halloween, I hope). The game was ported by Jeremy Maher, who has created several other apps for iOS, including Simon Graham and the Extraordinary Timepiece. Jeremy has been a pleasure to work with; I've really had to do almost nothing. Pretty much all of the features of the original are included. Two to five players (any combination of human and computer) can play on one device. Networked (online) multiplayer will not be part of the initial release. Each computer player has a name, and there are subtle differences in play style. All the basics are there - buy, sell, auction, coffins, villagers - with an option for either Basic or Advanced rules. Games can be paused, saved, and resumed at any time. There is some animation, as well as sound effects and an orchestral score. Volume for music and effects can be adjusted independently. There is also an in-game manual, which shows the original rules, edited and re-written as appropriate. As soon as it's on the app store, go buy it! My shul had a traveling dinner; we hosted two families for appetizers, and we went to two other families for main course and dessert. As hosts, I subjected my guests to some Apples to Apples, which went over pretty well, though we didn't have much time. During dessert, one of the other guests attempted to torment his non-family members with Snaps. He is the type who would not explain even a minute part of what was going on (no clues), taking pleasure out of being "in the know". I suppose he believed that we would enjoy being "driven crazy" while unable to figure out what was going on, but I don't really enjoy that; leastwise without at least some clue. So I simply looked up the game online, which greatly annoyed him instead. I suspected that the group would be small, even with my announcing the event in various locations. Everyone who came was a regular or occasional to the group, or a friend of one of them. This was fine, since my sukkah couldn't have held more people. Still, we need to find a way to reach out to more people; I know there are other gamers in Raanana and surrounding communities. These scores are approximate, except for mine and Nadine's. First play for Omer and Ben, second for me and Nadine. I requested this. The first time I played this I was unhappy with the amount of time you had to look at your opponents' boards and how difficult it was to do that. This time I felt a lot more comfortable doing it, and so could concentrate more on making better decisions. I enjoyed it. People acted to thwart me, of course, but they had limited ability to do so. Often they didn't have access to the resources required to play a card, while I did (only one of my neighbors had the resource and I didn't). So they either had to dump the card under their wonder or toss it for a measly three cash, or simply pass it on to me. The latter happened many times in age three. I started with two blue VP buildings in the first round. Most of the intermediate ones were then taken by others, but I ended with the most points in blue anyway (28). I built very few resources: only two. I had a yellow card that gave me a selection of one of four, and another yellow card that let me buy the other three resources for only one each from my neighbors. If everyone follows that strategy, a whole lot of buildings are not going to get built. It worked for me, though, because both of my neighbors built a lot of resources. Two of my opponents across the way (Omer and Ben) were battling it out for military might (and neglecting other point cards). Omer ended victorious, which is why he scored better than Ben; on the other hand, he also didn't win. I won nearly as many military points as he did with two military power, because neither of my neighbors cared to invest in it much. I also gained an (unfair) advantage with my wonder. The second level was "play any discarded building for free". We weren't exactly sure how to interpret that, but we took it that I could wait until the end of the game and then build any one card discarded from any age (including those discarded on the very last round of the game). The one I built was worth 12 points, far more than the value gained by any of the other players' second level wonder. The opening game for us. First play for Marcus and Ellis. Ellis scored big in the first round with 13 points. Nadine scored 13 points in the second round, and I scored 13 points in the third. I had a 35 income building, a church protecting it, and the role that doubles my income for one type of buildings and lets me keep up to $60. We thought I might be winning, but I was sure it would be close. I ended up with less owned property than I usually do, and Nadine squeaked by with the win. I won a few battles that I shouldn't have won in the second or third round. Of note was the final round. Nadine won the three gun chip away from both me and Marcus. Marcus and I then fought for a particular building, and even though he still had a 3 gun advantage, I won it. It turned out, however, that it was not the building that I had actually intended to take (the one I wanted was next to it). So I screwed over Marcus and didn't end up with the building I wanted, anyway. Then Ellis picked up the building that he had bought, and he also realized belatedly that it wasn't the one he had actually wanted. First play for all of them. Abraham had wanted to get the game to the table for a long time. He knew it would be too long for regular game night, so Games Day was the chance to try it. It took them over 6 hours, including the rules explanation. I didn't see what happened. Peleg quit the game after about two or three hours, as he wasn't enjoying himself (he enjoyed only the attacking part, and there wasn't enough of it to make it worth his while). In fact, Peleg's attacking Daniel apparently helped Daniel win the game, as he was forced to take a lot of tundra (?) and he won many points on it. Or something like that. I think everyone else enjoyed it. I tested this out two player on Nadine. We got through most of the deck and then Nadine resigned. I had her down to a single animal, while I had three carnivorous beasties with lots of abilities. It seemed unlikely that she was going to be able to get anything up and living any time soon, not when she drew only two cards each turn (she couldn't find a way to kill her last creature). I enjoyed the game, again, with the provision that this kind of thing doesn't happen often against prepared players. Last game played, I taught it to Daniel and Laurie. Some very minor external conflicts arose before Daniel started a major one against me. I had seen it coming, and so I tossed out tiles in the round before, hoping to get exactly what I needed to defend against him: I had one green and one black; I tossed four tiles of blue and red; I picked two more greens and two more blacks). Now, I would have been content to have at least one of the colors defended. It turned out that I had exactly what I need in both colors using all six tiles: three green and three black tiles. Only once before in a previous game I had exactly what I needed using all six tiles (in that game it was 3 of one color, 2 of another, and 1 of a third). Daniel was rightfully discouraged - he had made the percentage play - but gamely continued to play. I built two monuments near the end of the game; I didn't even fully utilize them, taking only a few points in one color from each of them. Surprisingly, other people barely fought me for them. I was the only one to build monuments, toss tiles, or play a disaster (one, splitting Nadine from half of her supporting tiles in a kingdom). These actions are under-utilized by my group. The object is to submit the best set of arranged cards in one of four different prize tracks (A-D). You start with four cards. Beg, trade, win, or steal cards from other players to obtain the cards necessary for a complete set. Submit a set to any BGG.con organizer before Saturday 5:30 pm. Results will be tabulated and winners announced at 10 pm. 1. You may submit only one set of cards. Entries must be received by 5:30 pm on Saturday. 2. The number in the center of all submitted cards must be the same, as pictured. 3. You must submit exactly four cards. You must arrange the cards in a 2x2 grid, as pictured. Mark all cards with their location in the grid as follows: TL=top left, TR=top right, BL=bottom left, BR=bottom right. 4. You may rotate cards as required; mark all cards with an up arrow to indicate the top of the card. 5. Submit the cards in an envelope with your name on it. 2. Points are cumulative. For example, the set pictured scores 19 points (maximum is 36 points). • Prize track D: All sets that don't match any other track (easy). • Prize track C: If adjacent images on all interior edges (a) match in shape (medium). • Prize track B: If adjacent images on all interior edges (a) match in shape and filling (difficult). • Prize track A: If adjacent images on all interior edges (a) match in shape, filling, and color (fanatic). There will be one winner in each of the four prize tracks; the winner in each track is the person with the highest scoring set in that track. Ties will be determined randomly. Check out the list of prizes for the winners of each track by the registration area. I had a family from Raanana over for the first time for lunch, and the guy stayed after to play Scrabble with me. He was a tough opponent; he had obviously played in tournaments before. He played the only bingo during the game, but I beat him by a 50 point margin by playing a lot of double/double and double/triple moves. Meanwhile, in two online Scrabble games that just ended, I played 7 bingos between them. That's a streak I don't expect to repeat. Playing bingos (or words at all) in online Scrabble isn't the same. Since you are not permitted to submit an illegal word, you just keep playing around and clicking submit until the game accepts your play. It takes a lot of the edge out of the game, and it's definitely different than face to face play. Shabbat I went to my brother's and the kids wanted to play games (or hear stories) the whole time, even the five year old (I think he's five). I played Set with two of the younger ones, and I was shocked with how good them were, even the five year old. I didn't take sets myself; I only called Set and let them take the sets after they found them. So I would have killed them, technically. But I think they're going to get much better really fast. The other game I played was Dominion, three times. I lost the first game taking Conspirators and Pawns against my brother who was simply taking silvers and golds. Actually, I also did some bad planning and had some bad luck. I took a Mine early when I should have taken a Market (before I settled on the Conspirator strategy), and I got to use it all of once during the game. I requested the same set again, and this time I played more diverse and took more Markets and Spies. I won this game. In the third game, there were no bonus actions on any cards, but there was Throne Room and Black Market. I picked well with Black Market while Ben had the same luck problem I faced during my first game. I had a runaway win, even though Ben had accidentally stacked 18 provinces instead of 12 (I took 11 of them, while Ben took 6). The design goals for Spare Squares include: easy enough that anyone who is the slightest bit interested (definitely not the majority of people at BGG.con) will feel that they have some prospect of winning even if they don't spend a great deal of time on the game; yet rich enough so that those people who enjoy fiddling with the cards will have fun spending a great deal of time on the game and earn some kind of reward for doing so. It's not easy to hit that balance. An average random but legal arrangement of cards scores yields about 12 to 20 points along the outer edges. The maximum edge score is 36. 1. Requirements: I am thinking of removing the requirement for any kind of interior edge matching. All you have to do is match the numbers. In practice, that will require trading with no more than two or three people. This should yield a set with about 16 to 20 points with a bit of rotation. Trading with a larger group, say 12 to 20 people, should yield a decent score of 24 to 30. Those last few points to get to 36 are the hardest. 2. Bonus points: Completing the first level bonus is about as hard as trading with two or three people (up to five, perhaps). That yields the average edge score of 12 to 20points plus the 10 points bonus, for 22 to 30 points. This automatically shuts out a casual number match and rotation submission. A better first level bonus is 6 points, putting you in the same category as the edge match and rotation submissions. The second level bonus is as hard as the complete edge match. When combined with the average edge score (12 to 20), it should yield a little less than a perfect edge match (36) so as not to shut out edge matchers, so should be around 18. So 6/18 seems to be about right for bonus points. Of course, if someone has access to hundreds of cards and lots of time (as they will), they're going to raise their scores above 36 and they will win, putting everyone else out of contention. This is a discouragement to the other players. On the one hand, isn't that the way games are? The person who practices more at Chess or Tennis than you is going to win. On the other hand, I don't have the luxury of only catering my game to fanatics; I have to be inclusive of lazy people. 3. To solve this, I could make each point an "entry" into a random draw. In this way, a casual submission counts as 16 entries if it is worth 16 points. A fanatic entry of 40 points is 40 entries, but still not a guaranteed win. This neatly solves the problem ... except that I hate lotteries. I may have to swallow my pride. 4. Another solution is to divide the field up according to play tiers: one prize for sets with no matching middles, one prize for sets with first tier matching, and one prize for sets with strong (perfect) matching. Fewer people will play in the strong match tier, and one of them will get their prize. Many people (one hopes) will play in the no matching middle tier, and the winner can be chosen randomly among top scorers of this tier. This option still requires the number matching for all tiers, however prizes are not given out based on the number, but based on the tier (three prizes instead of four). I'm still thinking about it. Any other suggestions (that don't involve changing the entire concept of the game, or the design of the cards) are welcome. I created a new game for the next BGG.con. The game will be produced by Blue Panther LLC in a limited run of one. I struggled to figure out how pay for its production, since it was going to cost more to produce than BGG was willing to spend. I came up with the idea of asking BP to sponsor the run and put their logo on the game, to which they agreed. Win-win-win. I'm having fun with this design genre: "many players" social-strategy-trading games. I'm pleased with this particular design, which has strong design integrity. Designing for this genre has a kind of artistic integrity. Not many people are doing it. To make money, I would have to get hired by convention organizers or large companies or organizations who want a brainy activity for their employees during the yearly company kickoff meeting. However, the game could be adapted for a smaller group of players, say as few as three. Created, designed, and illustrated by Yehuda Berlinger for BGG.con 2011. Published by Blue Panther LLC. © 2011, Yehuda Berlinger. To obtain a copy of this game with customized rules and components, contact Yehuda at shadjon@gmail.com. The BGG.con print run is 5000 unique square cards. The object is to submit the best set of arranged cards in one of four different prize tracks (1-4). You start with four cards and an envelope. 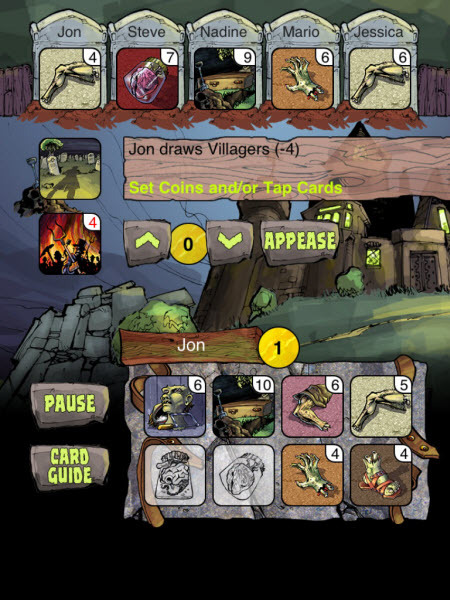 Beg, trade, win, or steal cards from other players to obtain the cards necessary for a complete set. Submit your set to any BGG.con organizer before Saturday evening 8 pm. Results will be tabulated and winners announced at 10 pm. You may submit only one set of cards. Entries must be received by 8pm on Saturday night. The number in the center of all submitted cards must be the same, as pictured. This number determines the prize track. You must submit exactly four cards. You must arrange the cards in a 2x2 grid, as pictured. Mark all cards with their location in the grid as follows: TL=top left, TR=top right, BL=bottom left, BR=bottom right. You may rotate cards as required; mark all cards with an up arrow (↑) to indicate the top of the card. Adjacent images on each of the four interior edges (a) must be the same shape. Filling and color do not have to match. Submit the cards in an envelope with your name on it. Points are cumulative. For example, the set pictured scores 19 points. 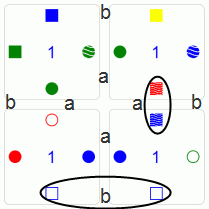 If all adjacent images on the four interior edges (a) match in shape AND filling, add 10 points to your score. Your thoughts? I will be playing around with the bonus scores to find the exact right values, but as long as it's in the ballpark it should be ok. I was considering a doubling bonus for matching the interior edges exactly, but doubling got me in trouble in the first game for being too strong. The players write on the pieces to play; this is required for a large convention like setting, but would not be required for a game played by 3 to 10 people around a table. For only three or four people I would start them off with more cards. Part of the integrity of the design is that the tiles and the rule-set are separate. The game can be made easier or harder on demand (by requiring no or all edge matches, or by requiring or ignoring matching fillings), or varying the point values (for instance, matching specific colors can yield different points). My inspiration comes from my previous BGG.con games, which were in turn inspired by Sid Sackson's Haggle. When I first saw the larger games that were to be played at BGG.con, they were all lotteries or tournaments. I thought that a convention of strategy gamers should have a single game to play with upwards of 100 people at a time that was not a lottery, trivia, or quiz games or a tournament of smaller games. I also drew inspiration from Eternity II, a game/puzzle I haven't actually played and whose name I actually forgot. Still, I remembered the idea of matching pieces and that there was some math behind it. I've cut down to 50 RSS feeds from my previous over 500. I used to see 50 new headlines every 15 minutes. Now I see about 20 an hour. Still too many really. I download the podcasts for long distance trips and occasional listening during work. I don't listen to all of them, God forbid. Cut out the podcasts and I'm down to 39 feeds, of which 30 or so are actually active. What's missing is striking: nearly any game blog, for one. It turns out that, if you're not interested in reviews, thoughts about upcoming games, rehashed game design notes, or session reports, there's not much out there. I would continue to read Purple Pawn, Eric Martin's BGN (now BGG News), and one or two others, but I'm forcing myself not to. Other than The Dice Tower, game podcasts are generally poor, unprofessional, and uninteresting. A few might have made the cut, such as Have Games Will Travel and Garret's Games and Geekiness, but the other mainstream podcasts are just so much better, and I haven't got enough listening time as it is. TDT is also still an order of magnitude less professional than the mainstream podcasts, but it's also an order of magnitude better than any other game podcast. I cut out fire-hose feeds like Techdirt, Slashdot, Mashable, and so on, since the real tech news will end up on CNN or NYT, and the rest of it was opinion. I'm a little surprised that the mainstream media won out in favor of blogs, but apparently they still know what they're doing. Naturally, I've also resigned from over 50 mailing lists (I'm still getting some list mailings; I can't seem to get them all) and removed most of the sites from my bookmarks and quick toolbars. Since I discovered the feed for my Facebook wall, I no longer feel like I have to remove friends from Facebook, though I still removed 50 friends; I'm down at 350. Many more will definitely be cut: gamers who know me from my writings but whom I don't really know. I'm waiting to see if I friend any of them in real life at BGG.con. When I have a spare moment to kill now, I still reach for my distractions: my RSS reader, some additional bookmarks. But there's a lot less there to distract me, now. As a result, I got back to work on a game design I want to complete by and for BGG.con, and it looks like it will be ready to print and ship on time. I'm just working out the money and sponsorship. The latest Jerusalem Strategy Gaming Club session report is up. Games played: R-Eco, Stone Age, Tribune. Rochelle brought another new player, Tanya. Avraham/Sara 80, Jon/Tal 20 We played only one round of this. The hands were unremarkable and no one called Tichu. I went out last. Laurie arrived midway and looked on. Rochelle and Tal started off in the middle of the map, with Tanya focusing on the east coast and Sara on the west. Competition for the routes was light, and everyone seemed to finish their original tickets with only a little trouble. Everybody drew more tickets to complete, but no one seemed to draw tickets that fit their existing networks well. Rochelle and Tanya realized near the end that it could be expedient to get points just by claiming routes without relevant tickets. No one completed all of their tickets. Rochelle helped Tal in this regard by blocking one of her needed routes in the final round. Sara got the Longest Route bonus, and Rochelle got the Most Completed Tickets bonus. Sara won, with Rochelle not too far behind in second place. I hate dice. Every once in a while I'll play a dice game just to see if my feelings have changed. I find this game dull, except near the end when specific point avenues are calculable. And all because of the dice. I tried a starvation strategy, and it did pretty well. It would have done even better if a) Abraham didn't specifically thwart me on several occasions taking cards that were ok for him but much better for me, and b) I didn't make a few missteps, choosing higher valued goods only to dump them as resources for cards, anyway. And the set collection mechanic doesn't work; even if you collect the entire set, it's still only 8 points a card - less than the 10 or more points that many other cards provide. And you're not going to get the whole set, because you have to wait for very specific cards as your set nears completion. as opposed to other cards that have many copies. Abraham adds: After some discussion on what to play, we settled on Stone Age. Laurie, who had never played before, was impressed by the components but was skeptical about the role of dice in this game. Yehuda was willing to play anything, and furthermore, was willing to give Stone Age another chance despite previous bad experiences. Yehuda went for a starvation strategy, while I focused on the food track. Laurie, who was trying to figure out the optimal way to play, was influenced by our strategies and tried an occasional starve strategy while also advancing on the food track, which is not a viable winning strategy. Yehuda, although sitting in front of me in turn order, often did not choose the options that would gain him the most points as his first choice, to which I would scoop up opportunistically to thwart his plans. This greatly reduced the level of enjoyment for Yehuda, but I view as proper play in any worker-placement game. I won with a score of 180 something with Yehuda roughly 30 points behind in 2nd place. Laurie enjoyed the game, and although Yehuda was agitated by my style of play, seemed content with the feasibility of the starvation strategy. I was happy that the usual complaints of “whoever rolls the highest wins” did not surface at the end and that my victory was more from choices than chance. I (Jon) will note that I had a number of good rolls, while Laurie had a few bad rolls as well as a number of poor, wasted choices. Tal played this with Sara while waiting for us to finish Stone Age. Abraham: Sara offered to play something with Tal while we were finishing up Stone Age. Tal chose Jaipur because it looked pretty and nice, which it pretty much is. Sara won the first and third rounds, and Tal won the second round. Both the first and third rounds were decided by fewer than five points. I am taking steps to cut myself off from most of the electronic world. It's achingly hard. I'm addicted. I don't want to be addicted. I've tried to delete some - any - Facebook connections for YEARS. It took me that long to delete JUST 10; 10 people who I knew once but have not heard from since, in whom I have no interest, and apparently who have no interest in me. Why did it take so long? Because I'm addicted. Why delete a Facebook connection when I can hide it? Why delete an RSS feed when I can skip over or suspend it? Because if it/he/she is there, then, in my spare moments, I peek at it. My electronic life is so full of convenient interesting distractions that I could spend ... I have spent ... every spare moment consuming, instead of producing. Actually most of my spare moments, for the last three and a half years, have been devoted to Purple Pawn, scanning, reading, searching, writing, researching, etc, etc. With the help of some co-writers (more or less; I wrote many more posts than the others did) I turned Purple Pawn into a strong. though small, voice in the game world. I became a better journalist, learned a great deal about the game industry, broke a few important stories, and made a number of friends and contacts. Before I started Purple Pawn, I wrote a great many excellent posts on this blog; since I started Purple Pawn barely any. Purple Pawn - and the other time suckers I have let overwhelm my life, such as social media - distracts me from new game designs, completing a short story I started, writing a number of books, going out, meeting people, experiencing culture, exercising, ... I don't know that I'm going to get these done if I drop these distractions, but I know that I'm not going to get them done if I don't. So. I am cutting Purple Pawn out of my life (for at least three months, probably far more). I am eliminating 90% of my RSS feeds, including nearly all game related info (my blogroll is disappearing, sorry), most tech, and nearly all news. Don't be offended if you are suddenly dropped from my social media; it doesn't mean I don't like you. This blog will continue; writing is a small distraction, but it also stimulates my creative process. It will especially be used during my upcoming November trip to Ireland and BGG.con. If you want to follow along, and you're no longer connected on Facebook, feel free to use RSS or Feedblitz, located on the top right of the page. If not, thanks for reading until now. This chapter is over. Daniel finally returns after traveling. While waiting for others to arrive to play Evolution. I reminded Ellis about the rules to this game. I think he won fairly quickly. I then reminded/taught the rules to Rochelle. I won this with a multi-color Taki card. Scores approximate; first play for everyone. This was game number three of four sent to me by a Russian game company to review, which I will do in full once I have played all four. The first two games were simple and not too interesting, although they may hold some appeal for younger players. This game actually looked pretty good. We played it, and what do you know, it was pretty good. You simply have to play your cards and keep as many creatures alive as possible from round to round (until the end, which is the scoring, and so the only point that really matters). Easier said then done. I'm eagerly looking forward to trying it again. There were, however, a few rules questions, and a few concerns about luck and repetition. Peleg had requested this game already last week, as he was eager to play something that involved units and conflict. Laurie was interested in playing with the nice bits. I don't know how the game went. I suggested this game. First play for the other players, second play for me. It was a little more complex than the games Rochelle had played until now, but she picked it up well enough. I recalled enjoying the game to some extent, but having a problem with it. Abraham reminded me of what it was: downtime on other players' turns. Yup. Still there, and still a problem. We had far too many piracy attacks, so I took a decoy ship card which sent them elsewhere for the rest of the game. Ellis got an enhancement that moved him faster on the standard module development track, and that's nearly the only thing he did from then on. I pulled into a lead at one point, carefully knocking down the player closest to me each time in the process. This process was almost always reverse within a round or two, and I was back to being tied for first. That's how the game ended: Rochelle gained a module and tied me in a territory. I won on the tiebreaker.